Hi pinups! It's time for my second Spoonflower project (if you missed my first post featuring some stunning constellation print jersey fabric, check it out HERE), and I'm sewing with Summer in mind! For April's Spoonflower make I wanted to shake off my tights and jeans and sew something which would hopefully bring out some Spring Sunshine. I work from home and it's no secret my uniform consists of lounge wear and pjs. So after coming out of my Winter sewing cocoon, I wanted to sew a garment which felt light and colourful which I could get lots of wear out of, without making a dress (there's a few in the sewing queue). So I decided to sew myself a comfy cotton dressing gown to wear around the house, over whatever my work uniform is that day! I've made option A from the McCalls M6659 pattern which is a short robe. The pattern is almost kimono like with flared sleeves and who doesn't love a pattern when it says's 'easy' on the front! After an initial Google for pattern reviews, the M6659 seems to be a popular pattern and I hoped I would enjoy it too. 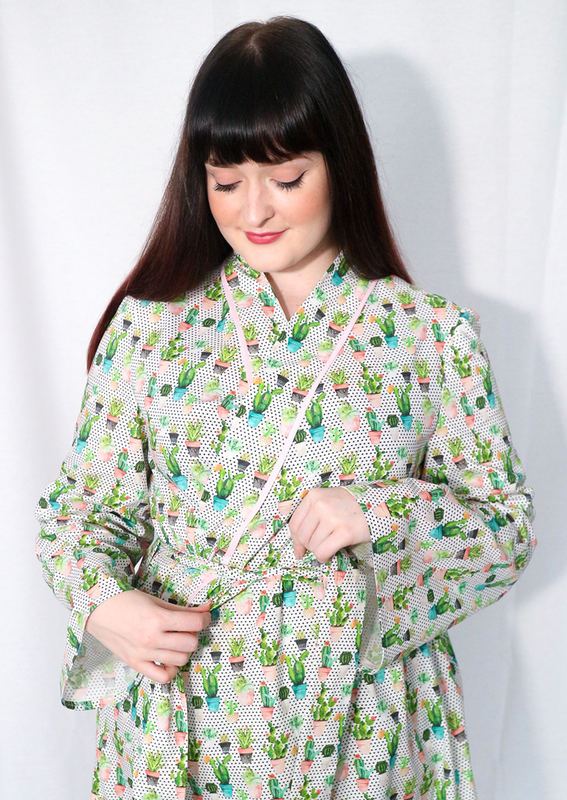 Once I had settled on sewing a light weight dressing gown, I thought Spoonflower's classic Basic Cotton Ultra would be perfect. The weight of the fabric compliments the shape of the robe, and whilst it isn't super flowy, it still holds the shape of the robe without being stiff or feeling rough against the skin. As well as being easy to wash & care for as this garment will be getting lots of wear. 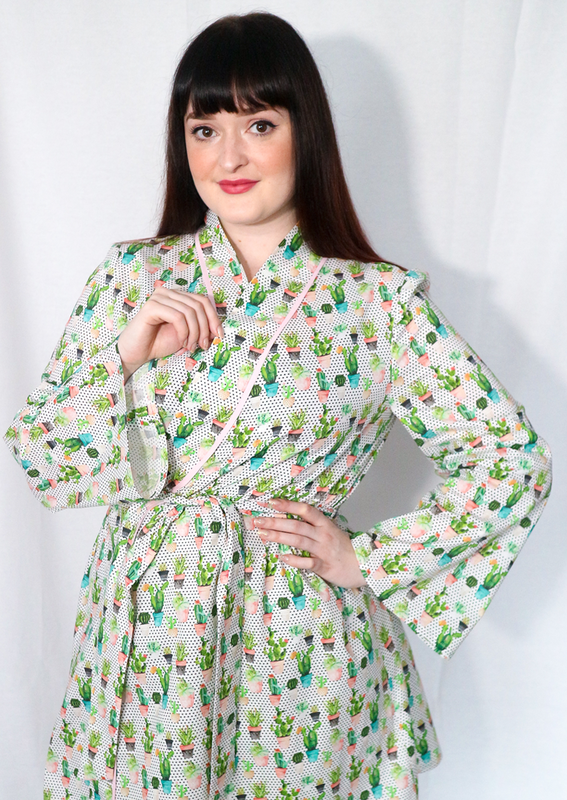 Cactus prints have started filtering in to fabric shops and it seems to be a popular trend on the high-street from fashion to interiors. 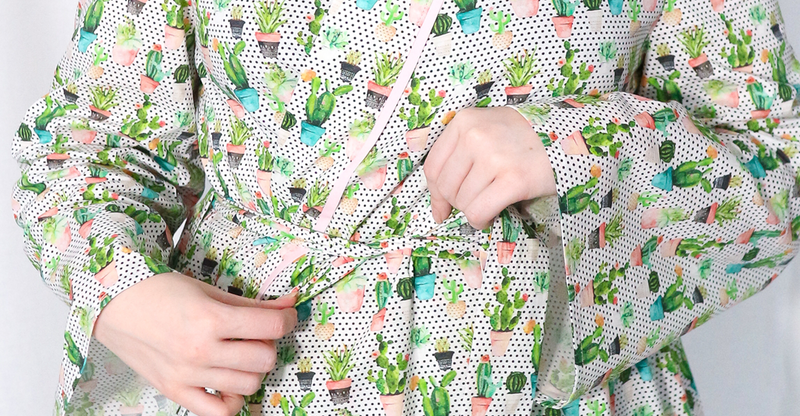 But succulents AND polka dots? A match made in print heaven for me. I love the colour palette of the fabric, it's bright and colourful with hints of mint and pink. After so many great versions of the M6659 pattern online, I hoped it was going to be nice and easy to sew with minimal fit issues. I wanted a garment with a simple shape to really show off the pattern of the fabric. I'm really pleased I opted for this pattern and option A, as I think the fabric and pattern are a great match. I added a touch of plain baby pink piping I had in my stash to highlight the neck band and break up the print. The whole sewing process for this robe was enjoyable and simple and I really enjoyed taking the time to sew this one to a high standard. It was one of those rare sewing projects that was a breeze from start to finish and I love the final garment. Notions: Baby Pink flat cotton piping. Watch out for: I took extra care sewing the piping for a neat finish. Make Again? : I'd love to make the other options on this pattern. Overall, I couldn't be happier with my new cotton dressing gown and I've worn it every morning since I made it. 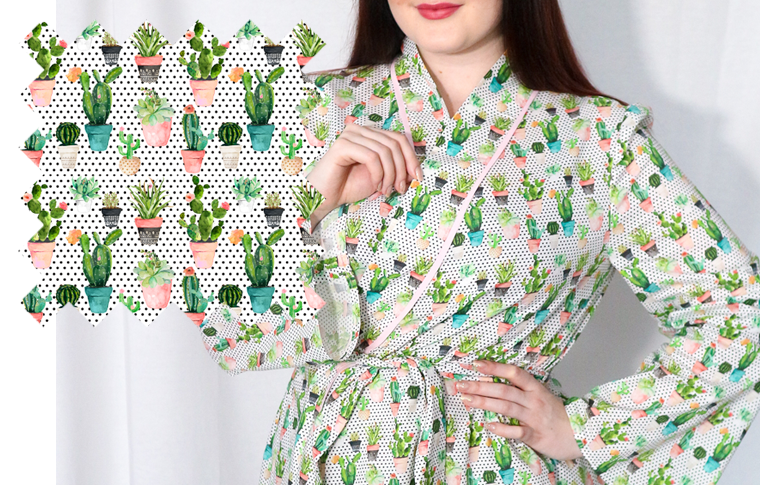 The print never fails to cheer me up and I just need the weather to warm up so I can spend my evenings lounging in it too! Don't forget to visit Spoonflower to make your own fabric dreams come true! I can't wait to show you my next project and my favourite fabric of all the ones I've selected. I know I shouldn't have a favourite, but you guys are going to LOVE it!